Project obstacles and solutions: In June 2014, the City of Muncie, Indiana announced plans to construct a new 400 space, three-level parking garage adjacent to its downtown convention center. The garage would also provide parking for the new ARC Hotel, a Courtyard by Mariott with a twist. The 125 room hotel is designed to serve as a teaching center for persons with disabilities who wish to work in the hospitality industry, in conjunction with the ARC of Indiana Foundation and General Hotels of Indianapolis. The parking garage was designed to accommodate disabled travelers, as well as provide space for bicycles and electric cars. Garmong Construction Services was selected as the general contractor for both the parking garage and the hotel. Wilhelm Construction did the concrete work on the parking garage. 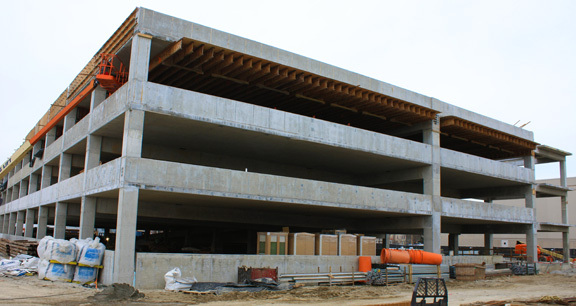 IMI supplied 5,000 yards of concrete for the 140,000 square foot parking garage. The post-tensioned decks were required to meet 3,000 psi in 48 hours. IMI QC/QA used a corrosion inhibitor in the mix, along with a high range water reducer. The superplasticizer kept large pours possible by keeping the concrete workable without increasing the water-to-cement ratio and decreasing the strength. The corrosion inhibitor protects the steel tendons from breaking down in the concrete. The concrete performed very well, meeting the 3,000 psi strength specifications in 24 hours - half the time required. In 2016, this project was awarded an Outstanding Concrete Achievement Award from the Indiana Ready Mix Concrete Association for a cast-in-place commercial structure. For more information on early strength in concrete, contact the sales representative for your area. Click here.